We partnered with Jameson Irish Whiskey and aged a special beer in the barrels. Hibernia launches Monday April 15th (Tax Day). It will be in both draft and cans. We will be launching it here in the tap room followed by a happy our with our Jameson friends at Nickel City Delray Cafe. Hope you can join, it may help take the edge off Tax Day. The #eastside Cool Party shooting range is hot! Candy and carnival prizes for the kids, adults can win a commemorative glass! Join us tomorrow as we tap the special version of Lobby Boy porter featuring Srsly chocolate and Greater Goods Coffee Roasters. This is a limited release and won't last long! Thanks to BLEND Magazine and Black Joe Lewis for coming by the taproom! This weekend is an all-American excuse to indulge in junk food and great brews from local makers including Zilker Brewing Company and Friends and Allies Brewing. Bravery Red IPA now available in the tap room! This 6.8% Red IPA is characterized by notes of melons, tropical fruit, caramelization and pine. It is double dry-hopped with Huell Melon, Saphir, and Simcoe hops. #BraveryIPA will be available in our taproom for a limited time, so be sure to stop in and check it out! 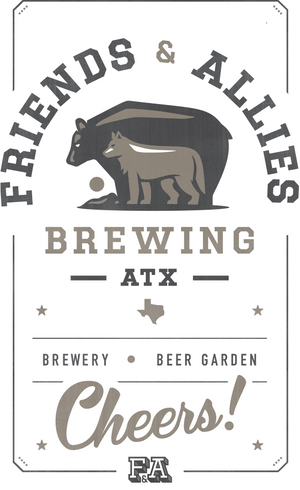 Friends and Allies Brewing is giving some love to a university in town that has nothing to do with Longhorns. Join us this Sunday at our brewery for Houston Barbecue Project #atxvshou2018 from 1pm-4pm!! We are beyond excited to host so much talent this weekend! Happy Weekend, Fleabies! We hope to see you out and about - Saturday at Friends and Allies Brewing and Sunday we're doubling up at Fareground at One Eleven & Radio Coffee & Beer. WooHoo!!! We can't wait to see all the unique offerings at Austin Flea today! Join us for beer, holiday shopping and the last weekend of Eastside Austin studio tour! Coming out for the East Austin Studio Tour 2018? Come visit us at Friends and Allies at 979 Springdale Rd. We will have local artisans with Austin Flea on Saturday, and we are walking distance to the events at Springdale General and Canopy. Follow this map to park in the back and come into the taproom to get your parking pass.